SOLD OUT! For those of you who won't be able to attend the event, we invite you to join us online. With the generous support of ScribbleLive, CJFE is live blogging an event for the first time! Clicking on this link will take you to a live feed, where you will be able to follow along with what the panellists are saying starting from 6:30pm EST. Members of the audience are being invited to add their comments through Twitter using #cjfelive, or by e-mailing comments directly to 24257@scribblelive.com. If you’re joining us online, you’ll be able to add comments and ask questions directly on this site during the event. We will also be filming parts of the event, including interviews with the panellists, which will be posted to our website following the event. 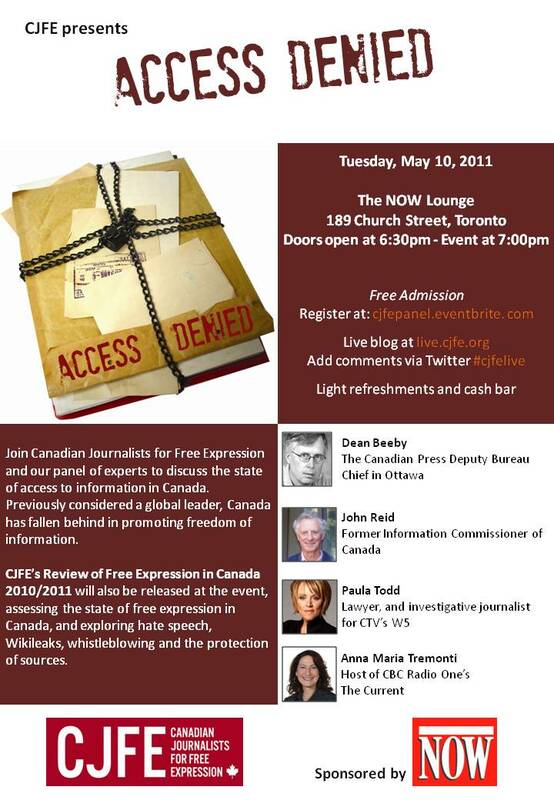 Canadian Journalists for Free Expression (CJFE) presents a discussion about the state of access to information in Canada on May 10, sponsored by NOW Magazine. CBC Radio One’s The Current’s Anna Maria Tremonti will host, with expert panellists Ottawa Deputy Bureau Chief Dean Beeby of the Canadian Press, former Information Commissioner John Reid and investigative journalist with CTV’s W5, Paula Todd. Previously a global leader, Canada has fallen behind in promoting and protecting freedom of information. Last year, CJFE gave a failing grade to the Harper government’s access to information policies, citing delayed response times and federal agencies invoking national security at the drop of a hat to restrict information. At the event, which marks World Press Freedom Day, CJFE will release its second annual “Review of Free Expression in Canada 2010/2011”. Paula Todd will discuss the Review’s assessment of the performance of Canada’s major institutions on free speech. The Review also explores hate speech, Wikileaks, whistleblowing and the protection of sources. WHEN: Tuesday, May 10, 2011. JOIN US ON OUR LIVE BLOG!